This week we test drive the Special Edition Sunrise Yellow 2015 XV Crosstrek that will be limited production and are arriving now into U.S. showrooms. This special edition Sunrise Yellow 2015 Subaru XV Crosstrek can’t be missed on the road. We drove the small crossover for a week and the weather was cloudy and rainy the whole time. It was like driving a ray of sunshine in a sea of drab-colored cars this week. Based on the well-equipped 2.0i Premium trim, the Sunrise Yellow XV base price is $22,295 (plus $850 destination). What’s special about this new XV Crosstrek? The Special Edition Yellow option package ($1,995) features STARLINK Multimedia audio system, 7-inch touch screen display with multi-touch control, 6-speaker audio plus voice-activated controls. It also comes with SiriusXM Satellite Radio (subscription required), a vehicle information display; SMS text messaging, iTunes Tagging capability and dual USB ports. 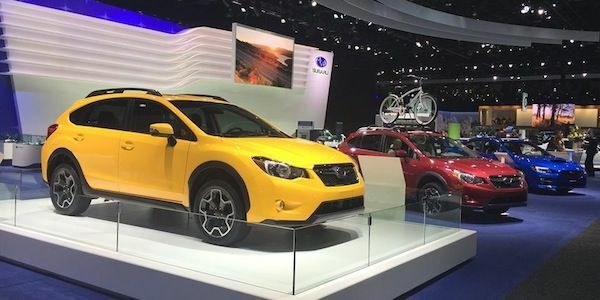 Additional features on the XV Crosstrek Special Edition include power moonroof, and of course the exclusive new Sunrise Yellow exterior color with body-color foldable mirrors with integrated turn signals along with blackened headlight bezels. The Special Edition also offers Keyless Access with Push-button start as well as Pin Code Access, leather-wrapped shift lever handle and steering wheel. This XV also comes with the Lineartronic Continuously Variable automatic transmission ($1,000). Total MSRP including destination, $26,140. Before we take this new Subaru crossover out on the road we’ll step inside. Subaru isn’t known for luxurious interiors, but those who buy this multi-use vehicle will transport kids, dogs and recreation equipment and don’t need it and don’t really want it. The cabin is clean and uncluttered and the controls are simple to operate. The dash and door panels are wrapped in soft-touch trim. It also came standard with the Package with heated front seats, heated outside mirrors and windshield wiper de-icers that we used this week with the cold rainy weather in Denver. This model is ideal for those living in cold weather climates. We drove both the gas and hybrid models and found the hybrid higher on the fun to drive meter. 2015 XV Hybrid gets the same 2.0-liter Subaru Boxer engine, but uses a slightly higher compression ratio (10.8:1) than in the standard gas model (10.5:1), along with...read more. The XV Crosstrek is designed for utility and is this vehicle is functional for hauling the family and for recreation. Cargo carrying ability is plentiful with 22 cubic feet of volume behind the back seat and 50.2 with it folded down. A flat load floor allows for maximized us of that space. It also comes with standard raised roof rails that are ideal for carrying mountain bikes, snow boards or a small boat. Inside there's plenty of room for 6-foot-tall drivers and even tall passengers in the rear. I took two 6-foot, 2-inch friends to lunch who sat in the back without touching the roof, and the headroom in the back seats does not diminish with the moonroof. Back doors open wide for easy entry and exit or securing larger cargo. The Sunrise Yellow XV comes powered by the same 2.0i Premium’s 2.0-liter boxer that produces 148 horsepower and 145 lb. ft of torque. It comes mated with Subaru’s Continuously Variable Transmission (CVT) with a 6-speed manual mode with steering wheel paddle shifters. It also features Subaru’s Active Torque Split version of Symmetrical AWD for all-weather capability. EPA fuel mileage estimates are 26/34 city/highway mpg and 29 mpg combined. This is a 1 mpg increase over the outgoing model. With Subaru’s standard Symmetrical all-wheel-drive, the XV crossover is one of the most fuel-efficient utility vehicles in America delivering best in-class fuel economy. A new 6.2-inch infotainment system with rear vision camera is now standard on 2015 XV Crosstrek 2.0i, 2.0i Premium and Hybrid models. 2015 gets the 6.2-inch touch display with rear vision camera, swipe and scroll multi-function control for audio and other features. The new infotainment system features Subaru STARLINK smartphone integration with Aha Infotainment, Pandora and iHeart Radio. (4 speakers for the 2.0i; 6 speakers for Premium trims). Think of the XV Crosstrek as a sporty city crossover. The suspension and steering have been retuned for sportier driving dynamics, so the XV is fun to chuck into corners. We tested the XV in the mountains west of Denver and this crossover with the continuously-variable transmission (CVT) with a simulated manual-shift mode and steering wheel paddle shifters offered plenty of spirited driving fun. Unlike most CVT automatics, Subaru’s Lineartronic CVT is integrated into the electric drive motor and provides smooth power that lifts engine and road speed similarly. Unlike others that puts engine revs high while vehicle speed catches up. The extra hp and torque enabled us to pull up the high altitude interstate with plenty of extra power for passing. The CVT has six settings to imitate a 6-speed automatic's gears, and we kept the paddle shifters on the wheel busy on the twisty mountain roads west of Denver. Who should look at the XV Crosstrek? XV Crosstrek comes with 8.7 inches of ground clearance that gives the crossover a “go-anywhere” attitude. It’s based on the Impreza platform but comes with larger front brakes, a larger fuel tank, 17-inch alloy wheels and special black wheel arch and rocker panel cladding. XV has the ability to be a daily commuter during the week, and an off-road trail runner on the weekends. If you lead an active lifestyle and will use it for recreation, the XV is an ideal vehicle. The XV also comes standard with Subaru’s excellent Symmetrical AWD system that makes it a true off-roader for recreation enthusiasts. Another driving dynamic of the small crossover is the lower center of gravity due to the boxer engine that sits lower in the chassis than the typical small SUV. This contributes to it handling better than almost anything else, and it still has close to nine inches of clearance underneath. It made a difference this week as we powered through the twisty curves west of Denver in the foothills. The VX had minimal body lean and roll even on tight S curves. Like other Subarus, the XV Crosstrek will leave you feeling confident on loose gravel roads, wet slippery pavement and with its Symmetrical all-wheel-drive system, it can navigate some of the worst weather conditions you can throw at it. With its extra ground clearance, its an ideal crossover that you can take off-road and get away from civilization. It’s a multi-purpose all-weather vehicle that is ideal for recreation enthusiasts. The 2015 Subaru XV Crosstrek limited production Special Edition Sunrise Yellow model will set you apart from the crowd even more. This color suits the car so well. The local Subie dealership got one and it's still on the lot three weeks later! I can't understanding it that color suits the car so well. People are so boring. I wish my 15 STI was that color!! !